Limited Spaces Available! For reservations call 800-688-5871. Spaces are extremely limited this time of year so book early to ensure the date you want. World famous Blue Lagoon Island is a place like no other in the Bahamas. If you want to experience what the true secluded island life is like, this is where you need to go. 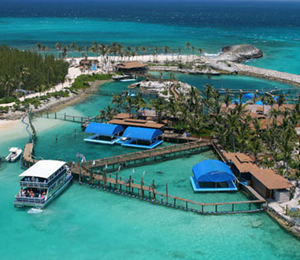 Located about 3 miles from Nassau, Blue Lagoon Island has remained pristine and untouched throughout the years. Even today, very few visitors actually make the journey out to the island. When out on Blue Lagoon Island, you will be able to enjoy this amazing natural habitat and all it has to offer. Swim in the crystal clear waters, or lay out on the white sand as you bask in the warm Bahamian sun. Explore the island on foot, maneuvering your way through hundreds of native coconut palm trees and running into our beautiful hidden lagoon in the middle of the island. The Blue Lagoon Beach Day Package includes the scenic round-trip boat transportation to the island where you will get great views of Nassau's historic harbor and the gorgeous Paradise Island, use of the lagoon beach and all the great amenities offered to visitors (including hammocks, beach chairs, and picnic tables), use of gaming and recreation areas (including volleyball and basketball areas), and unlimited use of floating tubes and mats. What are the prices for the additional activities? Snorkel gear is $20 for rental plus a $20 refundable deposit. We provide Ferry transportation from the Paradise Island Ferry Terminal to Blue Lagoon, you must get to this location from your hotel or ship. What is the weather cancellation policy? If the activity must be cancelled due to bad weather, and you cannot reschedule, you will be issued a full refund. Where is the departure point for this tour? Check-in instructions will be included in your activity confirmation email. What Am I required to bring? Please bring your email confirmation, towels, sun screen and form of payment for your remaining balance. What about sharks and other sea creatures? With all the media hype it's understandable why people often ask this question but the truth is that unprovoked shark attacks are very, very rare and attacks on snorkelers are even more rare. Our staff are all trained in making sure your trip is safe and enjoyable. It is your responsibility to make sure you are aware of and understand all restrictions pertaining to this tour before booking online or over the phone. It is your responsibility to ensure that you are medically qualified and within any limits listed below in order to participate in this activity. No refunds will be given to those who reserve a spot and can not participate due to the restrictions listed below. For more information please read our cancellation policy and terms and conditions page or call our staff with any questions regarding your ability to participate. BLACKOUT DATE 2/14/19 Blue Lagoon is closed on this date. The 11:45AM Beach Day is a shorter day on Blue Lagoon, departures from island are 4:15pm at the latest. Cameras are NOT permitted while doing any dolphin or sea lion programs. Observers only are permitted to have a camera, or persons just visiting for the beach day. Bahamas Snorkeling Tours is always interested in your tour experience with us. We hope you enjoyed your tour and love to hear comments. I have been to the Bahamas many times, but Blue Lagoon Island Beach Day is one of my favorite trips! It includes everything that everyone should do here. As a Bahamas veteran, I can say only the best about this experience! Thanks to the professional guides! I was a bit worried about kayaking because I had never done it before, but the instructions were great and I had such a good time!